The Economic and Financial Crimes Commission (EFCC) the other day blamed 6 fishermen as well as their company, Oshine Resources Ventures Limited before the Federal High Court in Lagos, for presumably doing illegal fishing. 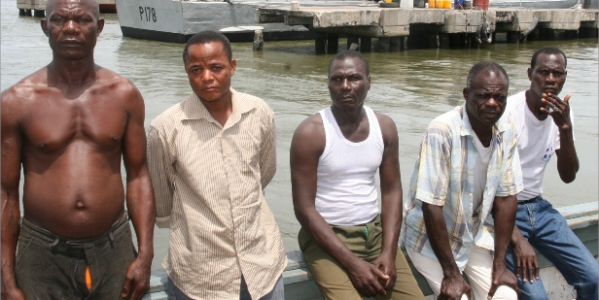 The accused persons; Adekunle Oshingbosi; Momodu Ibrahim; Idowu Tuesday; Togbosi Christian; Benjamin Eyinle; Anthony Medoho and Oshine Resources Ventures, were earlier arrested by officers of the Nigerian Navy for fishing in Nigerian territorial waters without necessary approval on March 27, 2014 . They were arraigned before the court presided over by Justice Ibrahim Buba by the EFCC on two -count charge of conspiracy and economic crime. According to the commission, the accused violated Sections 1(1)(2) of the Seas Fishery Act Cap S4, 2004 by engaging in fishing activities in the Nigerian territorial waters without obtaining lawful authority . They pleaded not guilty to the charge and their counsel, Kehinde Yekeen, moved a bail application on their behalf. The lawyer urged the court to admit the accused persons to bail in liberal terms, ‘especially in view of the poor health of some of them’. The prosecution did not object to the bail application, a development that made Justice Buba to grant them bail in the sum of N10 million each with one surety in like sum each, who is to produce two recent passport photographs. The court also ordered that the accused persons should be remanded in the Ikoyi prisons pending when they would perfect their bail conditions.